UPDATE: 9/23/2014, 4:15 p.m. – The original headline for this piece, and information contained within, was based information provided during and after the presentation suggesting it would take place on September 23. While preparing to re-share the piece this afternoon, we learned that it will instead be held on a new, yet to be confirmed date in the near future. It will be shared here once it is finalized. 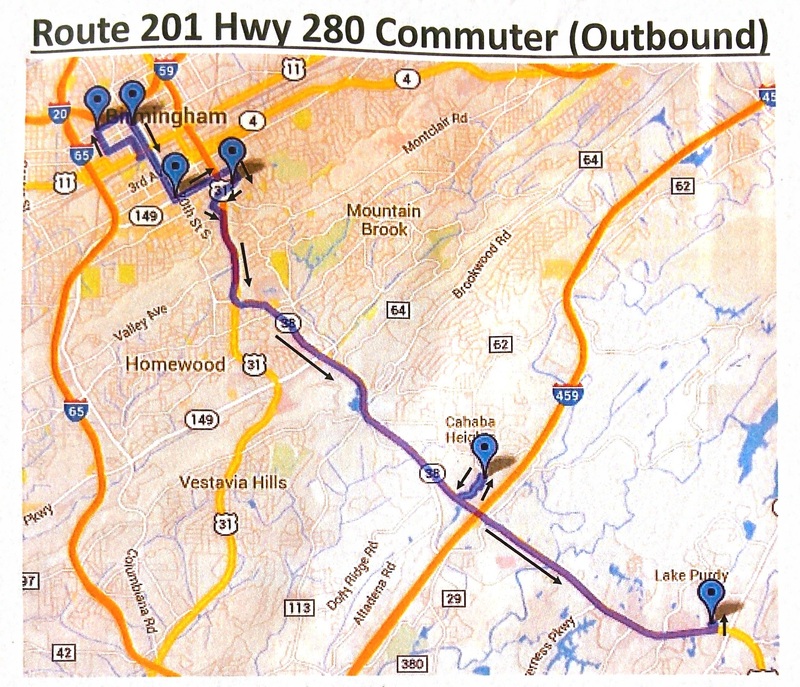 ### Birmingham area residents living along U.S. Highway 280 may soon have another option to consider during their morning and evening commutes. Members of the Birmingham City Council’s Transportation and Communication committee heard from Henry Ikwut-Ukwa, manager of planning and development for the BJCTA, on Wednesday afternoon about proposed commuter route along the perpetually congested thoroughfare. The proposed route, which would be known as Route 201, would run four times a day initially (two trips inbound at 5:45 a.m. and 6:30 a.m. and two trips outbound at 4:30 p.m. and 5:30 p.m.). The buses would operate between the Walmart location along Highway 280 near Lake Purdy and State Highway 119 and the BJCTA’s Central Station (soon to be replaced by the intermodal facility now under construction), stopping at The Summit, St. Vincent’s Hospital UAB, the central business district, and the Social Security Building (located at the corner of 14th Street North and Abraham Woods, Jr. Blvd). It was stressed that the route is only proposed at this point and is subject to changes. It is one of three routes currently under consideration for pilot commuter service in the area. One of the other proposed routes would operate during peak morning and afternoon travel periods between downtown Bessemer and the Galleria in Hoover. A third route would serve as the long-talked about shuttle service between downtown Birmingham and Birmingham-Shuttlesworth International Airport. The seven new buses being used for the pilot effort were purchased using grant monies obtained with local matching funds provided by the city of Hoover originally intended to provide assistance for a city circulator. It was later changed to allow for the purchase. (It is one of several orders for new buses received in recent years by the BJCTA.) A restriction on the how the grant could be used prevents them from being added to the existing fixed routes. Ikwut-Ukwa placed the estimated cost to operate the service at $101,400 and that it could be accommodated in the current operations budget. He told the committee the authority was anticipating an estimated early usage of 25-35 riders; each bus can hold 26 people and are ADA accessible. He also informed them the authority’s board was looking at the system’s fare structure and that the cost for riding on this particular route had not been determined as of yet. There will be a public notification meeting held on Tuesday, September 23, in the Arrington Auditorium on the fourth floor of the Birmingham Public Library’s central branch from 5:30 – 7:30 p.m. in the near future. It’s hoped those in attendance will help them to refine and develop the pilot route and schedule. Uber had already turned to social media to push back against proposed changes to the taxi ordinance, suggesting via email that it would be “anti-consumer” and creating a hashtag, #BirminghamNeedsUber, to garner and organize support for the service. 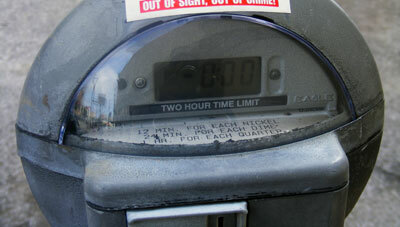 Throughout the entire period though, there has been little discussion about the actual ordinance changes. This link will take you to a copy of the working document published as a PDF; the changes are underlined with strikethroughs visible where language has been removed or modified; a “clean” copy has also been made available for you to review. A copy of the revisions made to the transportation ordinance earlier this year has also been uploaded to provide a point of reference and so you can actually see where changes have been made. An initial review of the documents prior to publishing this afternoon suggest they support statements made by councilors and city officials that the majority of the changes made were simply to define the service for purposes of the ordinance. The changes appear to be similar to changes passed earlier this week in Columbus, OH and ones being considered in New Orleans, LA (though Uber’s biggest issue there seems to involve fare minimums). This morning it was announced a meeting to discuss the proposed changes in the Crescent City originally scheduled to take place July 22 has been rescheduled for next Tuesday, the same day Birmingham’s City Council is scheduled to take the item back up.